Shot from the cave. 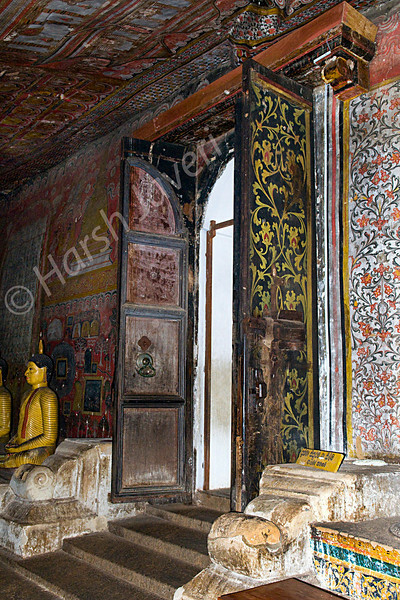 Entrance to one of the five caves of Dambulla rock temple. The temple is composed of five caves, which have been converted into shrine rooms. The caves, built at the base of a 150m high rock during the Anuradhapura (1st Century BC to 993 AD) and Polonnaruwa times (1073 to 1250), are by far the most impressive of the many cave temples found in Sri Lanka. The largest cave measures about 52m from east to west, and 23m from the entrance to the back, this spectacular cave is 7m tall at its highest point. Hindu deities are also represented here, as are the kings Valgamba and Nissankamalla, and Ananda - the Buddha's most devoted disciple. I was hoping we would see more of the caves...It's nice that you take time to give us the history. The colors and artwork on the doors is very pretty. Very beautiful and thank you so much for sharing the information. Amazing! The delicate colours and tones make this a very attractive shot. Interesting info about this beautiful shot. Hershy- Today's daily is a crop not a pano.